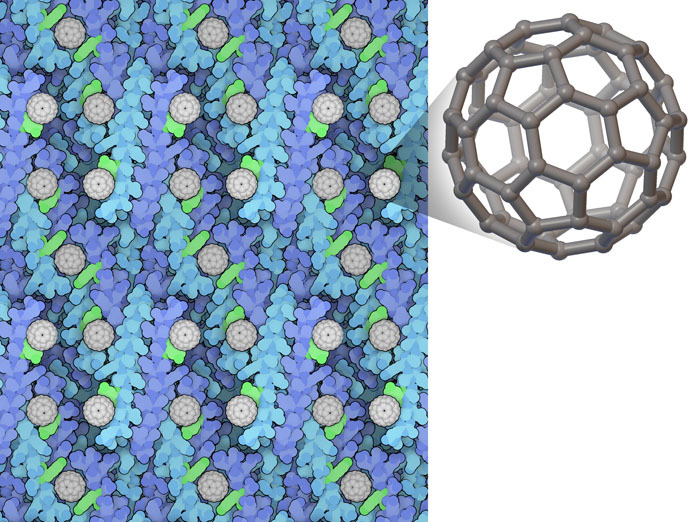 Crystal lattice of COP (blue, with tyrosine in green) with fullerenes (white). Pure carbon is found in many forms: a perfect three-dimensional lattice of carbon atoms provides the strength of diamonds, and two-dimensional sheets of carbon atoms provide the smooth, slippery feeling of graphite. Researchers discovered a new form of carbon in 1985, with 60 atoms arranged to form a symmetrical hollow sphere. Because of their similarity to the geodesic domes designed by Buckminster Fuller, these new molecules were called “fullerenes”. Like diamond and graphite, this new form of carbon has its own properties: fullerenes, and tube-shaped variants called nanotubes, can conduct electricity or heat, but at a much smaller scale than typical copper wires. Because of their perfect, symmetrical shape and surprising properties, fullerenes have become a favorite subject in nanotechnology. However, fullerenes have a major drawback for life sciences applications: they are insoluble in water. Scientists are now designing new interactions between proteins and fullerenes (and other nanoparticles) for novel applications in nanotechnology and medicine. To design a protein that binds to nanotubes, researchers noticed that the geometry of an ideal alpha helix matches the honeycomb geometry of graphene. So, they positioned alanine amino acids along an alpha helix to match the center of the repeating hexagonal unit of the graphene sheet. Then, they engineered new interactions based on a designed protein that forms a four-helix bundle, so that the helices associate side-by-side around the nanotube. When they made these peptides, they found that they bind to nanotubes, just as they were designed to do. Serendipitously, they also found that a tyrosine amino acid on the peptide flips out to form a little cage that can also enclose fullerenes. This designed alpha helix, called COP (C60-organizing peptide), forms a crystalline complex when mixed with fullerenes. PDB entry 5et3 shows how two neighboring COP peptides cup the fullerenes with their tyrosine amino acids, forming a large superstructure with many COPs and fullerenes in defined places. When tested, fullerenes or COP proteins by themselves are not conductive, but this 3D lattice of perfectly-placed nanoparticles and proteins does conduct electricity. Calixarene molecules (in atomic colors) bind to lysozyme (blue) and cause it to aggregate into tetramers and higher-order structures. Researchers are also designing nanoparticles for specific tasks, and combining them with proteins. Calixarenes are composed of four linked benzene rings. Larger chemical groups are connected to one side of the benzene ring, forcing it to open up and form a cup. If designed correctly, with the proper chemical groups around the rim, calixarenes can selectively bind (or “host”) a particular charged or neutral molecule. They were originally designed to bind to small molecules and ions, but researchers have also repurposed calixarenes to bind protein surfaces. The structure shown here is lysozyme with calixarenes bound to its surface (pdb entry 4prq). In this structure calixarenes are acting in two different ways. Half of them recognize and “camouflage” the charge of an arginine amino acid on the lysozyme surface, and the remaining ones are hosting PEG (a compound used in the crystallization of proteins) and act like a big gluey ball to fill spaces between the proteins. Through these interactions, this calixarene promotes assembly of lysozyme to form tetramers, which further assemble into long repeating chains. Scientists are exploring hosting molecules like calixarenes to promote (or reduce) protein aggregation and assist with protein crystallization. (Left) Signaling protein 14-3-3 (blue) bound to peptides (magenta) from its partner protein C-RAF. 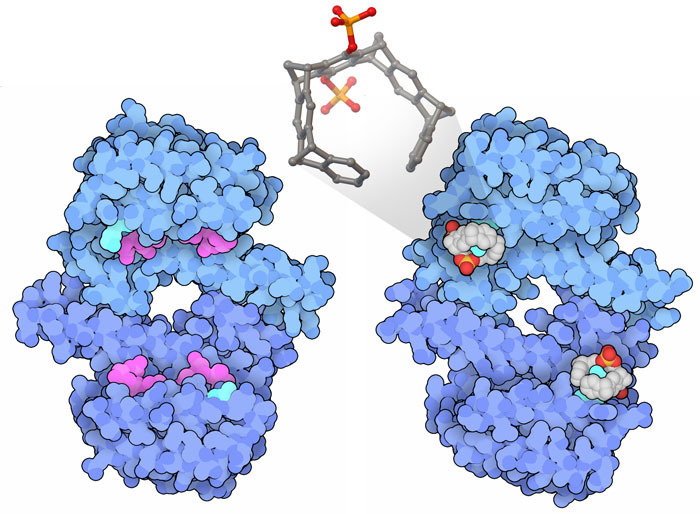 (Right) Molecular tweezers (atomic colors) bind to a lysine (bright blue) and block the peptide-binding site. Researchers are also designing nanoparticles to bind to specific amino acids and modulate the function of proteins. 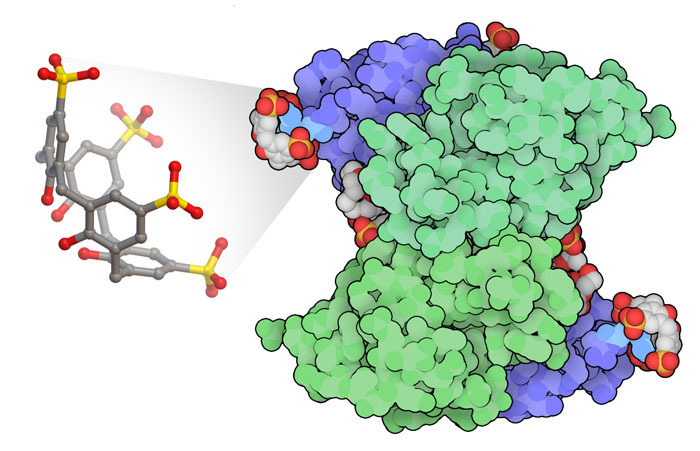 For example, a C-shaped “molecular tweezer” has been designed with two negatively-charged groups, making it both water-soluble and specific for binding to lysine and arginine. Researchers found that this nanoparticle inhibits signaling by the 14-3-3 protein. In the structure (pdb entry 5oeh), the tweezer binds to a single surface-exposed lysine. As seen in PDB entry 3nkx), this lysine is near the binding site for other signaling proteins such as C-RAF, suggesting that the tweezer acts by blocking the binding or changing the dynamics of these partner proteins. An isotope of xenon (129-Xe) is used as a contrast agent for magnetic resonance imaging (MRI) in medical diagnostic testing, both as a gas to image airspaces in the lung, and dissolved in body fluids to image the bloodstream and tissues. Designed cryptophanes are being developed as a way to target the xenon to specific proteins. Cryptophanes are hollow shells, but with openings on the sides that allow entry and exit of host molecules. 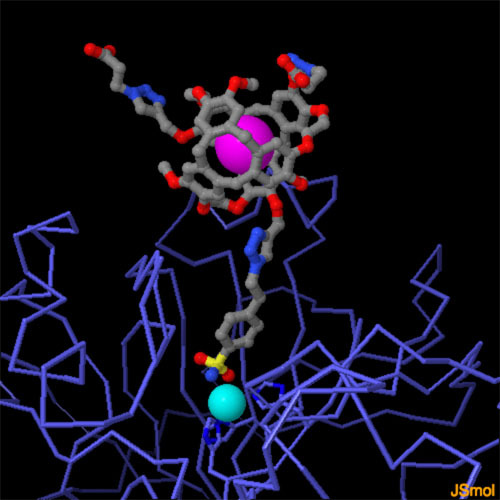 The cryptophane shown here is the right size for a single xenon atom (shown in magenta), and is coupled to a specific inhibitor of carbonic anhydrase, which recognizes a zinc atom (turquoise) in the enzyme active site. Upon binding of the designed cryptophane to the target protein, xenon displays a distinctive MRI spectrum. To explore the structure of this cryptophane bound to human carbonic anhydrase II (PDB entry 3cyu), click on the image for an interactive JSmol. Recognition of host molecule by a protein can also occur with no charged residues. For example, try looking at the insulin amino acids recognized by the inner core of cucurbituril, a molecule with a shape of a pumpkin (pdb entry 3q6e—be sure to look at the second biological assembly, since the first one doesn't include the nanoparticle). To explore the structure and properties of the nanoparticles themselves, try looking at the entries in the Ligand Depot, such as the one for fullerene or the molecular tweezer. S van Dun, C Ottmann, LG Milroy & L Brunsveld (2017) Supramolecular chemistry targeting proteins. Journal of the American Chemical Society 139, 13960-13968. 5et3: KH Kim, DK Ko, YT Kim, NH Kim, J Paul, SQ Zhang, CB Murray, R Acharya, WF DeGrado, YH Kim & G Grigoryan (2016) Protein-directed self-assembly of a fullerene crystal. Nature Communications 7, 11429-11429. 4prq: RE McGovern, AA McCarthy & PB Crowley (2014) Protein assembly mediated by sulfonatocalixarene. Chemical Communications 50, 10412-10415. 5oeh: D Bier, R Rose, K Bravo-Rodriguez, M Bartel, JM Ramirez-Anguita, S Dutt, C Wilch, FG Klärner, E Sanchez-Garcia, T Schrader & C Ottmann (2013) Molecular tweezers modulate 14-3-3 protein-protein interactions. Nature Chemistry 5, 234-239. 3nkx: M Molzan, B Schumacher, C Ottmann, A Baljuls, L Polzien, M Weyand, P Thiel, R Rose, M Rose, P Kuhenne, M Kaiser, UR Rapp, J Kuhlmann & C Ottmann (2010) Impaired binding of 14-3-3 to C-RAF in Noonan syndrome suggests new approaches in diseases with increased Ras signaling. Molecular Cell Biology 30, 4698-4711. 3q6e: JM Chinai, AB Taylor, LM Ryno, ND Hargreaves, CA Morris, PJ Hart & AR Urbach (2011) Molecular recognition of insulin by a synthetic receptor. Journal of the American Chemical Society 133, 8810-8813. G Grigoryan, YH Kim, R Acharya, K Axelrod, RM Jain, L Willis, M Drndic, JM Kikkawa & WF DeGrado (2011) Computational design of virus-like protein assemblies on carbon nanotube surfaces. Science 332, 1071-1076. 3cyu: JA Aaron, JM Chambers, KM Jude, L Di Costanzo, IJ Dmochowski & DW Christianson (2008) Structure of a 129Xe-cryptophane biosensor complexed with human carbonic anhydrase II. Journal of the American Chemical Society 130, 6942-6943. MM Spence, SM Rubin, IE Dimitrov, EJ Ruiz, DE Wemmer, A Pines, SQ Yao, F Tian & PG Schultz (2001) Functionalized xenon as a biosensor. Proceedings of the National Academy of Science USA 98, 10654-10657. J Baggott (1996) Perfect symmetry – The accidental discovery of buckminsterfullerene. Oxford University Press.